Longtime readers know I generally detest 3-D. I consider 3-D to be The Work of The Devil. I have seen five films in 3-D: Avatar, Hugo, Life of Pi, The Adventures of Tintin, and TRON: Legacy (the last one by mistake). I now add a sixth film, Gravity, so listen to Uncle Rick when it comes to Gravity in 3-D.
What I would tell anyone with doubts about watching this film in 3-D that I, someone who holds 3-D in contempt, think that not only is Gravity worth the price of 3-D but in many ways, it the only way to watch Gravity. I shy away from superlatives, but while watching Gravity, the words 'breathtaking', 'thrilling', and 'extraordinary' crept into my mind. 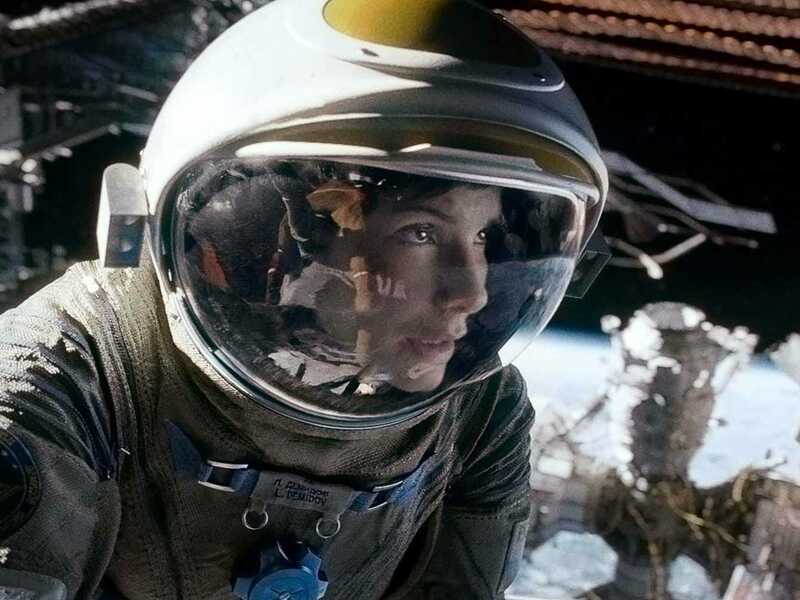 The rumors, the word of mouth, is all true: Gravity is an extraordinary visual experience, one that in its brief running time leaves you wondering how it will all turn out. The story is very simple: scientist Ryan Stone (Sandra Bullock), on her first space mission on the Space Shuttle Explorer, is repairing the Hubble Telescope. Overseeing the mission is Matt Kowalski (George Clooney), a cocky commander and a bit of a joker. Houston informs them that the Russians have blown up a satellite, with the debris coming their way at a rapid pace. They attempt to abort the mission and rush back to the Explorer, but the debris comes at them too fast. In the chaos Stone is temporarily separated from the ship, and when Kowalski recovers her, they discover the Explorer and her crew have been destroyed. Now they must travel through space to get to the International Space Station, where they may find rescue. However, there is more danger for them. There is loss, there is danger, and there are more obstacles should anyone live to tell the tale. Alfonso Cuaron, who wrote Gravity with his son Jonas, create not so much a story but a visual experience. The story may be far-fetched (one point I will address later) but instead Gravity gives us in its hour-and-a-half constant tension to find out how the two main characters will get out of this frightening predicament. Every time we think something is close to resolution, some obstacle comes up, and when we think there is no way out, something (usually logical) will come to someone to resolve the situation. I can say that Gravity gives us little time to breathe, to rest, primarily for two reasons. The first is that Cuaron never keeps the camera still. There is constant motion throughout Gravity, where we feel that sense of floatation, of being untethered from anything. The second is that there is no real release of tension to this crisis until the very end of the film, where after this frightening ordeal we are allowed a chance to breathe easy, finding that the situation has been resolved. The story keeps us in the here and now, never allowing us to never get away from the crisis. 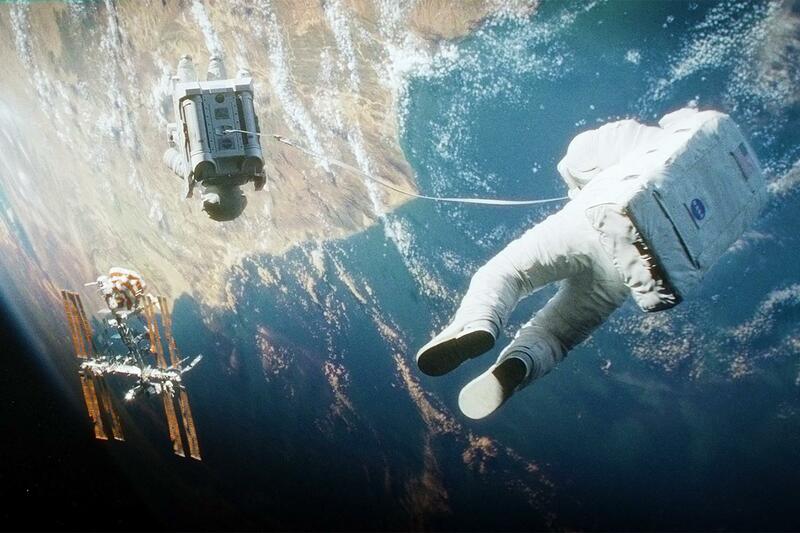 The tension throughout Gravity is what keeps us riveted to the story. Again, while the story itself is highly intelligent and memorable, I can't say the same about the dialogue, particularly Clooney's, where his character appeared to be too much of a joker. This seemed rather out of place since I would imagine that everyone on the Explorer would be more professional. Minor detail, but one that did trouble me. I digress to say that the perpetual motion in Gravity did make me a trifle seasick (and I imagine the 3-D did not help matters). However, the film is so beautifully filmed via Emmanuel Lubezki cinematography (to where I can say they might as well give Lubezki the Best Cinematography Oscar now and skip the ceremony altogether) that seeing the images from space, especially in that 3-D, is literally breathtaking. That is no exaggeration: there were times when I felt I could not breathe as the characters were going through space, fighting for their lives. The performances, especially Bullock, are some of the best in their respective careers. For most of Gravity, it is Bullock's Dr. Stone who has to carry the film, and her evolution from rookie astronaut to terrified woman to ultimate victor over space itself also holds us in total rapture. Bullock plays Stone as a real person, one who has fear but who also has a determination to live. Clooney's role was smaller, and he played what he excels at: the cocky guy with a quick quip and clever story. It was good but nothing amazing. In regards to other elements, Steven Price's score was a mix of thunderous music (a leftover of The Dark Knight effect) and something out of Music From the Hearts of Space radio show: in turns loud and soft. Kudos also to the production and visual effects, for we always felt we were in deepest, darkest space, keeping that atmosphere so incredibly realistic. The only quibble I might have involves a sequence that I said to myself is illogical. If one knows the basic of oxygen depletion we would know that, without giving too much away, it is a dream sequence, or at least a fantasy, merely because if it had actually happened, the story would be over. Minus that, this is something I rarely say, but in this case, I will make an exception: you need to see Gravity in 3-D. Again, something I rarely say, but Gravity will take your breath away. 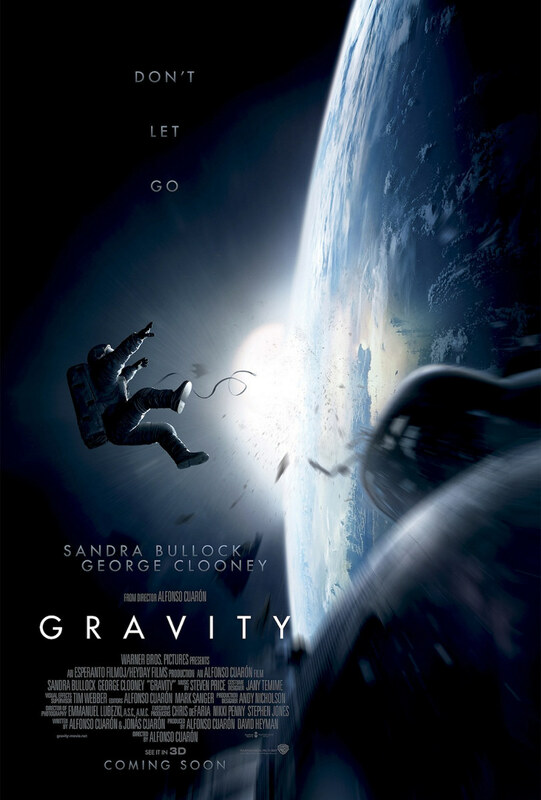 A brilliant film, well acted, filmed in glorious imagery, Gravity is worth the trip. From a technical standpoint, Gravity was near perfect. The visuals were simply incredible. I also noticed how effective the sound design was in the film. It was top notch, and really makes you feel like you are there just from the sounds. My biggest problem is that I never cared for a second about any of the characters, so the suspense was nonexistent for the second half of the movie. Also, the characters seemed very one dimensional. However, Gravity is still a good movie thanks to the technical aspects though. Good review Rick. Thanks, James. Though in fairness I think my mother gave Gravity the best review of all: in her words, "Two hours of Sandra Bullock crashing into things, and w/o ANY make-up! Couldn't she have looked a little more glamorous?"